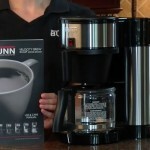 Bunn coffee maker review: Understand what the Bunn BXB Velocity Brew is all about and you just might love it. SHORT VERSION: This Bunn coffee maker keeps the water tank hot at all times so it can brew a pot of coffee in about three minutes. That’s fast. 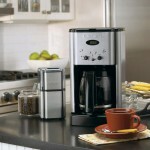 This coffee maker is best suited for daily use; infrequent coffee drinkers should look elsewhere. It’s a very simple machine, few bells & whistles. Many of the common coffee machine complaints have been made such as overflowing and coffee not being hot enough. Most owners love it, though. The Bunn coffee maker brand is kind of a legend, especially among old people. That’s because Bunn has been around since the 1950s and they literally invented the drip coffee maker that has morphed into the coffee makers we use today. They also invented the flat-bottomed “cupcake” style coffee filters that are used by this machine and many others. Waiters and waitresses have been pouring coffee from Bunn coffee machines for decades, so it’s no wonder that the name is trusted just about everywhere. 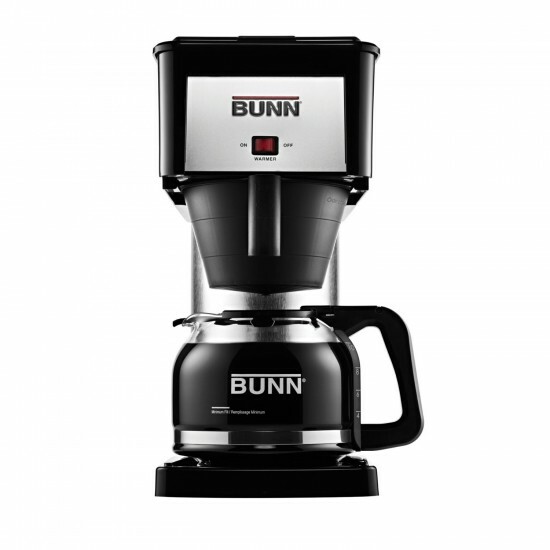 This particular Bunn coffee maker , the BXB Velocity Brew, has the typically spartan look of a Bunn and stands at about 14.5 inches tall and is nearly 14” deep, making it a good-sized coffee making machine. Water is added through the top of the machine, so extra clearance room will be needed under kitchen cabinets for filling. The Bunn BXB Velocity Brew coffee brewer is all about speed. It will crank out 10 cups of coffee in about three minutes while most coffee makers take around 10-15 minutes to perform the same task. This little miracle is possible because this Bunn coffee maker comes equipped with a built-in water heater that keeps the stainless steel water reservoir hot and ready to brew at all times. Just pour in cold water to push the hot water into the brewing system (this is how the reservoir always stays full) and a few minutes later a full pot of coffee will be ready. As far as taste goes, the vast majority of Bunn Velocity Brew reviewers on Amazon.com say the coffee is great. A lot of the negative reviewers also say it’s great (their negative opinions are for other reasons), so I feel pretty confident that this coffee machine will, if used properly, produce a cup of coffee you’ll really enjoy. Other than that, this Bunn coffee maker doesn’t have a lot of extra features because it doesn’t really need them thanks to the ultra-fast brewing. It won’t pause the brew if you try to pour a cup before brewing is finished … since it only takes three minutes to brew a full pot, there’s really no need to worry about this. It is also not programmable because, again, it only needs a few minutes to do the job. Another feature that is lacking is a 1-4 cup option because, on “normal” coffee makers, the first few cups of coffee that are produced are at a lower temperature than the rest of the pot. This is because normal coffee makers heat the water during the brewing process, and the 1-4 cup function’s purpose is to produce extra-hot water that is specifically for a smaller brew quantity. The Bunn Velocity Brew , of course, keeps the water hot beforehand, thus making such an option obsolete. And, quite frankly, the market that this coffee machine is meant to appeal to is not the crowd that only wants a cup or two. Remember, Bunn’s history is rooted in commercial coffee making (i.e., in restaurants) and that legacy is evident here. Many owners, with both positive and negative opinions of this Bunn coffee maker, have also commented that Bunn’s customer service is quite good. Of course, customer service experiences are different for everyone, but it’s encouraging to know that their reputation in this area is generally a positive one. 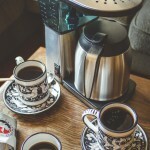 In all, despite a very specific setup that is required before making your first pot of coffee with the Velocity Brew (setup tutorial here), this Bunn coffee maker is a very simple machine. It’s not a pulley, lever, inclined plane, wedge, screw, or wheel-and-axle, but this Bunn coffee maker is indeed a simple machine. If you’re an occasional coffee drinker who isn’t in the habit of making a full pot of coffee at least once or twice a day, you should probably be looking at a different model. This coffee machine is designed to be on and ready 24/7 which makes it a bit of an energy hog. It’s hard to say just how much this will add to the electric bill each month, but it’s most certainly going to be more than a traditional coffee maker that only heats up water when in use. Some users are in the habit of turning their Bunn Velocity Brew off when not in use and, yes, this will save energy; the downside is that it takes 10-15 minutes to heat up the water when the coffee maker is turned back on again. 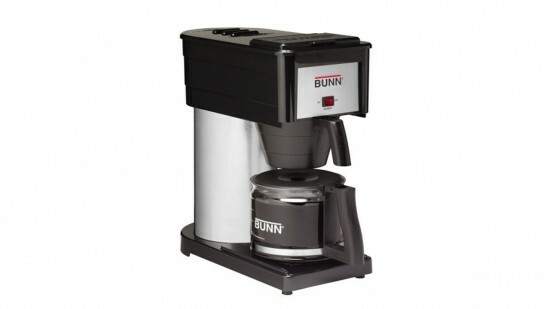 Turning off the machine completely negates the speed advantage this Bunn coffee maker offers. A lot of negative reviewers have also reported issues with coffee grounds overflowing from the basket and making a big mess all over the kitchen counter. This could be attributed to especially soft water flowing through the machine too quickly and, to compensate for this, Bunn will provide a free “flow restrictor” sprayhead that is easy to install; it doesn’t come included with the machine, but it can be requested by phone. It is also possible that the wrong paper filter is being used (of course, Bunn recommends using Bunn brand filters) or the sprayhead that is included with the coffee maker may not be attached properly. 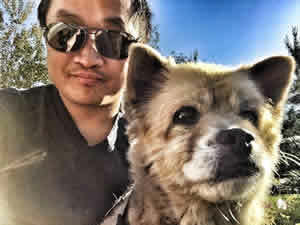 Some other owners have complained that the coffee isn’t hot enough, and Bunn suggests checking to see if the vacation switch has accidentally been flipped. The warmer switch on the front of the machine should also be turned to the “on” position. Also, there is no auto-shutoff function on this machine, but the orange “on” indicator for the warmer plate is very visible on the front of the coffee maker. The general consensus on the Bunn BXB Velocity Brew is that it’s a quality coffee machine. It is extremely simple to use and can produce a full pot of great coffee in just three minutes. 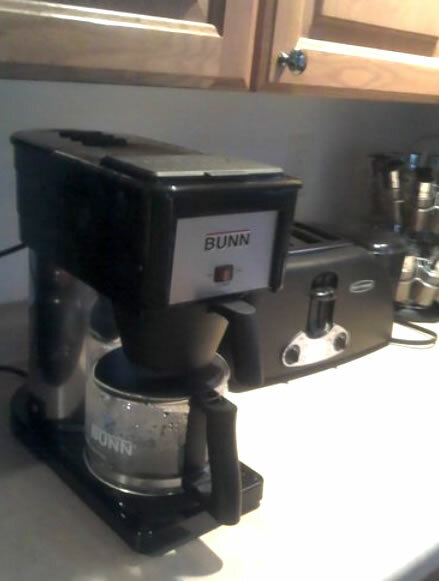 However, as of this writing, roughly 18% of reviewers on Amazon.com have given this Bunn coffee maker a rating of three stars or less. Close inspection of these low ratings reveal that some users simply bought the wrong machine and have no business owning a coffee maker that is always ready to serve their infrequent coffee needs. Many others have an issue with overflowing coffee grounds and, again, this sounds like something that is easily remedied. As simple as this coffee maker is, there is still room for user error, and I suspect many owners make a critical error when setting up their new Bunn coffee maker. Bunn specifically states the following in their Velocity Brew user manual: “DO NOT PLUG IN BREWER UNTIL STEP 5!” Bunn writes those words in all-caps for a reason; supplying power to the coffee maker before you’re supposed to in the setup process is a big no-no. In Bunn’s words, “Improper setup will result in permanent damage to your brewer.” Some new Bunn owners undoubtedly ignore these instructions and then wonder why they have problems making coffee. Read the instruction manual first and follow the setup instructions carefully; you only have to do it once! And for the love of coffee, DO NOT PLUG IN YOUR BREWER UNTIL STEP 5! Do that right and you should never be more than three minutes away from a full pot of great coffee. This nice lady isn’t the most engaging speaker in the world, but she does a really great job of showing off the BUNN BXB’s features and functions! BUY IT, but only if you are a daily coffee drinker. I do appreciate the speed and ease of use with my BX brewer. But I find it requires more coffee to brew a stronger cup compared to our old kitchen aid. I guess that’s the tradeoff for speed.